In Chrononauts, each player becomes a time traveler, with a unique identity and a secret mission. 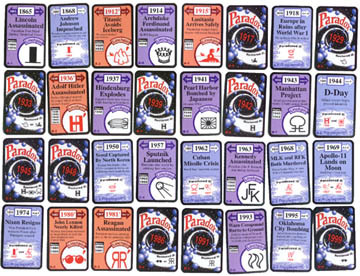 During the game, players travel backwards and forwards through history, doing all those things people have always dreamed of using a time machine to do: Visiting the great moments of the past, peeking into the future, collecting up impossible artifacts and priceless works of art (at the moment just before history records their destruction), coming to grips with the paradoxes of time travel, and of course, changing pivotal events and altering the course of history itself. How would the timeline be different if Lincoln and JFK had not been assassinated? And is that the version of reality that you came from originally... the one you must return to in order to win? It's all packed into a fast and easy Fluxx-style card game that will take you to the beginning of time and back again. There are 14 unique Identity cards. This card tells you how to get your character back to your version of reality, and thus win. It also features some background information on your character, in the form of a 55 word short story. Inverters are used to change historical events on the TimeLine. There are six different kinds of Inverters: Prevent Assassination, Avert Disaster, Halt Attack, Sabotage, Restore History, and the all-purpose Reverse Fate. Patches are used to repair Paradoxes. Whenever history is changed by a chrononaut, Paradoxes, like holes in the space-time continuum, are formed down the line in the Future. These Paradoxes must be repaired. This is done by playing the Patch for the appropirate year onto the opened Paradox on the TimeLine, thus stablizing the alternate reality. There are 21 different Patch cards in the deck. 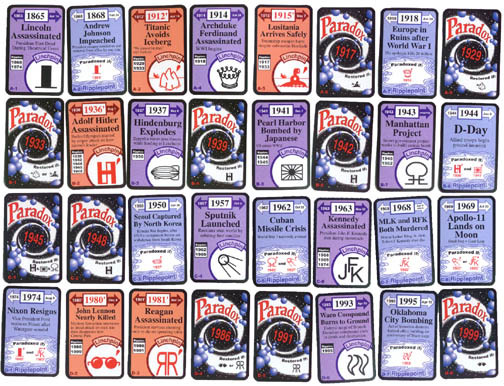 Artifact cards represent various amazing items from the past or future, which only a time traveler could acquire. They are played like Keepers in Fluxx. There are 15 of these in the game. Actions are single-use event cards that each have their own special instructions. There are eight different Actions: Get There First, Sell an Artifact, Perform a "Miracle", Discontinuity, Time Vortex, New Mission, It Never Existed, and Your Parents Never Met. Just follow the directions on the card. Certain very powerful actions are classified as "Timewarps" because they distort actual game time and are therefore subject to certain restrictions. The four Timewarp cards are: Memo From Your Future Self, Fast Forward, Rewind, and Quick Trip into the Future. Again, follow the directions on the card.